This marker in front of the Huff House in Dalton, Ga., notes the home's Civil War history. The Huff House in Dalton, Ga., was Confederate Gen. Joseph E. Johnston's headquarters during the Civil War. The house was lived in until the 1970s. It was recently acquired by the Whitfield-Murray Historical Society. 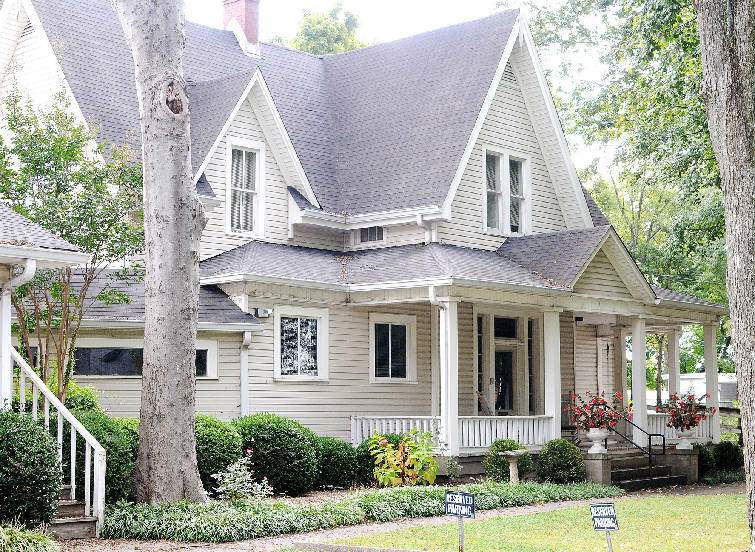 DALTON, Ga. - When Confederate Gen. Joseph E. Johnston's headquarters were in what's known today as the Huff House in the 1860s, it faced the railroad tracks that run nearby. But now the house, built in the 1840s, faces Selvidge Street. That's because the home was turned about 160 degrees in the early 1900s. "They turned it with mules," said Marvin Sowder, member of Whitfield-Murray Historical Society and the Civil War Roundtable. "They lifted the house on a turnstile of some sort and pulled it with mules. The family stayed here while it was being turned. It would have taken several weeks to do it." Sowder believes the house was also moved closer to Selvidge Street when it was rotated because of where an old well has been covered in the yard, which typically indicates where the back of a house was. He doesn't think the home would have been connected to electricity or plumbing when it was turned and moved around 1910. But Sowder is still researching the home, which is the newest addition to the historical society's properties. 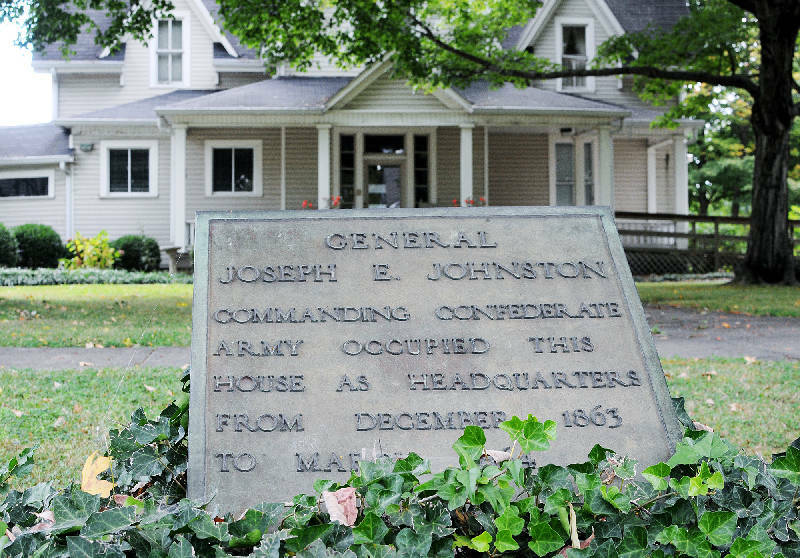 The house is most known for being Johnston's headquarters during the Civil War but has a longer history, which Sowder is unearthing. The Huff House was lived in until the 1970s and it was most recently used by Ken and Jim Boring, who are now deceased, as their business offices. The home was donated by the Borings' family. "We were flabbergasted," said Randy Beckler, historical society president. "We plan to have a memorial room in here to Ken and Jim Boring and their families." Plans for the Huff House -- named that for the last family who lived in the home -- aren't being revealed yet, Beckler said. "We will make an announcement on this property and plans for it," he said. "A lot of ideas have been kicked around. We will develop it into a local place for the community and a tourist attraction. ... We want to make it a showplace." Beckler said the home is architecturally sound and only needs some cosmetic work. The donation includes a 1.62-acre tract, which touches Selvidge Street and Cherokee Alley. The home was connected to another structure, which Beckler thinks will be separated. "We see a tremendous amount of potential for this property," he said. Already, historical society members have found several old photos in some of the rooms of the home. They included one of Johnston and a letter written by him, which have since been placed in the historical society's vault. The home was Johnston's headquarters from late 1863 until about April 1864. Sowder isn't sure why that house, owned by the R.L. Cook family at the time, was his headquarters. The Cooks had lost a son in the war. With Johnston being such a well-known and well-loved Confederate general, it's possible the Cooks offered their home to him to help with the war efforts, Sowder said. "Everything happened here," he said of the home. "This was the nerve center, where it all happened." Johnston would have sent all orders from the Huff House. It's rumored that Johnston drew a map on the wall showing roads and where soldiers were camped. "It would have been more convenient to have the map on the wall," Sowder said. "Other generals did that too. It's rumored to be in a bedroom. Others could have seen it easier on a wall." Beckler and Sowder hope to find where the map would have been drawn so they can see if it can be preserved. The Huff House is also where Gen. Patrick Cleburne made his call to arm slaves in exchange for their freedom. There is a historical marker outside the home detailing its significance. There are still several unknowns about the house. Not much research was done on the home previously since it was a private residence and then business office. "In years or months to come, we hope to know a lot more about the house," Sowder said.